Spiffy Dog is proud to offer a range of collars that are lightweight, quick-drying and breathable. Spiffy Dog collars are ideal for dogs who like to swim, as once wet Spiffy Dog Collars dry very quickly, so these collars are ideal for dogs who live near rivers, by the sea or dogs who take part in Canine Dock jumping. Spiffy Dog strives to design functional dog accessories using the latest and greatest materials and technology. The multi-award winning Spiffy Dog Air Collar is made of Aerospacer (the same porous, spongy material used in trainer shoes) and are fully adjustable with good scope for different-sized dogs' necks. They come in four adjustable sizes from petite (in limited styles) to large (please see measurements below). This material is lightweight, quick drying and breathable and is the only dog collar made from this exceptional material. Protect your dog from the chafing associated with ill-fitting collars that trap dirt and moisture, leading to discomfort. With this hi-tech Air Collar, dogs can be comfortable and stylish. Your dog swims? The Air Collar dries quickly. Your dog's collar stinks? The Air Collar breathes and does not retain odour as easily as webbing or leather and is washable. Your dog has skin allergies or irritations? The Air Collar is so lightweight and breathable that it will not cause or exacerbate irritations. You want your dog to look cool? The Air Collar comes in many fun, cool and original patterns so your dog will truly be a 'Spiffy Dog"! to suit his unique personality. one of Pet Product Marketings best 15 UK launches of 2009. 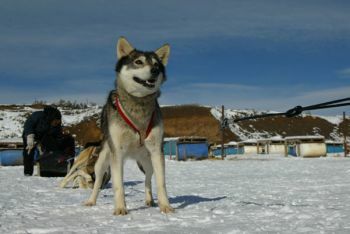 Spiffy Dog was named after an Alaskan husky called Spiffy (right), who is part of the Grizzle T Racing team also based in Steamboat Springs, the home of Spiffy Dog Pet Products. Grizzle T is operated by Kris Hoffman, a dog musher who offers incredible half-day trips dog sledding throughout the winter. Kris is also a long-distance musher and in 2011 he competed in Alaska in the Iditarod, the world's longest sled dog race. Xtra Dog were one of Kris' sponsors. For more details about Grizzle T click here. Spiffy Dog Pet Products was born in 2001 in beautiful Steamboat Springs, Colorado, USA. 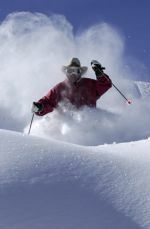 Steamboat is best known as one of America’s favourite ski resorts, giving it the nickname Ski Town, USA. It is widely accepted that more dogs live in Steamboat than people, so at Spiffy Dog it is called Dog Town USA! Former Olympian skier Billy Kidd (left) heads the Steamboat ski school and welcomes young and old to this amazing ski mountain. Steamboat is situated amongst wonderful forests, rivers and mountain trails making it a limitless playground for people and dogs and the perfect place for developing dog products. Here is what people are saying about Spiffy Dog Air Collars. "Amazing, there is no fur damage, even on a long-haired dog like mine ..." Mrs J Rush, pedigree dog breeder at the Manchester Dog Show 2011.